After the Blackout features characters scarred by estrangements or broken relationships waiting to be healed. In 2012, when Judith Thompson directed a collectively created show with Down syndrome adults, it was called RARE. Happily, while differently-abled performers may still be the exception on Toronto’s stages, they are no longer quite so rare. Last season alone saw Why Not Theatre’s adventurous Prince Hamlet, with the role of Horatio signed by hearing-impaired actress Dawn Jani Birley, and Ahuri Theatre and the Theatre Centre’s This is the Point, in which cerebral palsy-challenged actor Tony Diamanti delivered a startling and funny performance. Thompson herself returned to her Down syndrome group to create the play Wildfire, which premiered at Soulpepper last spring. Now the veteran playwright is back, same time, same place, with an ensemble of performers of various disabilities, for a new work entitled After the Blackout. 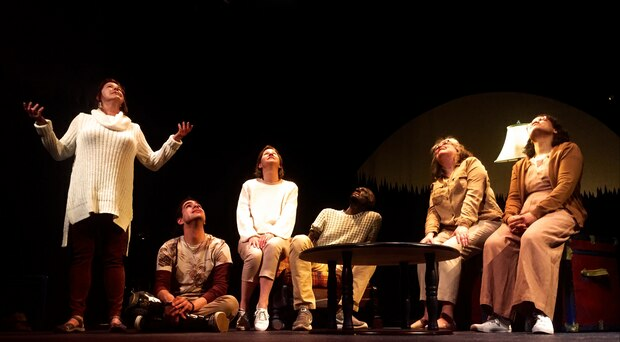 The show, like Wildfire, marks a transition for Thompson and her RARE Theatre Company. She is no longer just facilitating projects in which people share their stories but is now writing dramatic plays that blend the performers’ personal histories with fictional characters and scenes. After the Blackout is not about physical disability, per se, but rather a drama about emotional disability, its characters scarred by estrangements or broken relationships waiting to be healed. It opens with six friends – Roxy, Dash, Khari, Jamie, Beatrix and Zola – gathering at Roxy’s family cottage in the woods. As they sit around the fire on a starry night, drinking wine and chatting, flashbacks reveal their connections. Roxy (Mary Beth Rubens) is a former actress, star of the eighties slasher flick Prom Night, who suffered a traumatic brain injury. She’s also the birth mother of Dash (Yousef Kadoura), but gave him up for adoption as a baby. When Dash – who has lost a leg to fibular hemimelia – tried to reconnect with her as a young adult, she rejected him, which caused him to descend into depression and drug abuse. Robbing a house to pay for his crystal meth habit, he ended up at the mercy of its owners, the visually impaired Jamie (Melanie Lepp) and her professor husband Khari (Prince Amponsah), who lost both his forearms in a fire. In further flashbacks, we learn that Beatrix (Catherine Joell MacKinnon) and Zola (Tamyka Bullen) were a couple who split up over their conflicting attitudes towards being hearing impaired. And we see how the two women have also become estranged from family members: Zola from her brother Dash, Beatrix from her daughter Jamie. At its best, the play finds Judith Thompson in fine form, artfully shaping the real-life experiences of the performers into compelling drama. The framing cottage story seems like a rickety contrivance – until Thompson later dismantles it – and some of the individual scenes are weak. But at its best, the play finds the provocative playwright in fine form, artfully shaping the real-life experiences of the performers into compelling drama. And comedy. There’s a scene early on that shows Thompson at her darkest and funniest. It’s the one involving the break-in. As Dash lies on the floor, bleeding from an attack by Jamie and Khari’s dog, Khari whips out a knife and he and Jamie cheerfully debate the merits of punishing the would-be robber by inflicting their particular disabilities on him. It’s like seeing a Jacobean revenge tragedy played as drawing room comedy, making us laugh and squirm at the same time. Thompson has also written a stunning dramatic monologue for Amponsah’s Khari, in which contemporary police shootings of black men are equated with lynching and other historic racist atrocities. It’s delivered by the Ghanaian-Canadian actor with a seething rage that smacks you in the face. It has some of the appalling power of the torture monologue in Thompson’s memorable 2008 Iraq play, Palace of the End. At other times, though, she slips into a stilted mode of dialogue that’s more concerned with imparting information than revealing the character of the speaker. She can’t seem to kick that educational tone associated with her RARE productions. Amponsah, Kadoura and Rubens (who really did appear in Prom Night) are the experienced actors in the ensemble and, not surprisingly, their scenes are often the strongest. But stage newcomer Lepp is a natural and also has some of the wittiest lines, while Bullen and MacKinnon are highly expressive exponents of American Sign Language. 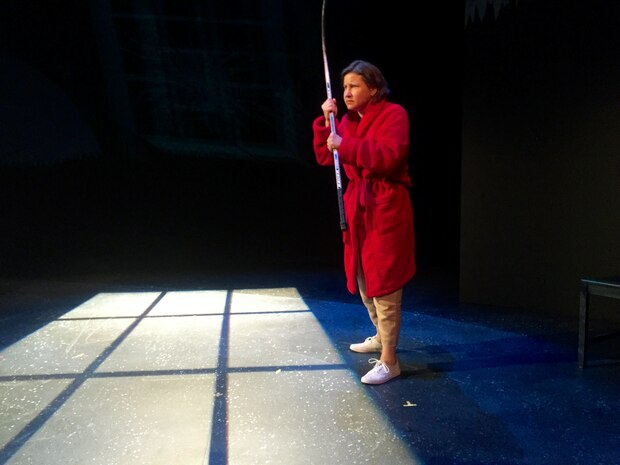 Thompson has directed the show in Soulpepper’s intimate Tank House space, with a simple set by Sue LePage, walls of projections by Melissa Joakim that plunge us into the woods and lighting, also by Joakim, that at times plunges us into semi-darkness. In doing so, Thompson cedes the stage to the blind, just as she does to the deaf by allowing for silent stretches of signed dialogue. I came away from the play particularly struck by Amponsah’s monologue. The young actor and burn victim, who survived an apartment fire in 2012, has since made a comeback in several indie productions, but I hadn’t seen his work before now. I’d love to see him cast in other roles in which his disability is an asset, as it is here, or better yet, totally irrelevant. Now that would be progress. After the Blackout continues to May 26 (soulpepper.ca).